ÖREBRO, Sweden — At this time of year the sun doesn’t set until past 11 p.m., and even then the sky never really turns pitch black. Sunrise comes at 3:30 a.m. Suffice it to say that Randy Beverly Jr., the new head coach of the Örebro Black Knights, has not been sleeping well. Beverly got even less sleep than usual on the last Saturday of June. His team already has been playing most of the season without its best running back—the one who’s good enough to run the same play all game long without diminishing returns—because he’s finishing up his college semester in Finland. Now, on the eve of the Black Knights’ game against the Kristianstad Predators, Beverly received word that his No. 2 running back will miss the game because his wife is going into labor. This is potentially calamitous news for a Black Knights team that is more committed to ground and pound than Rex Ryan. That’s more out of necessity than anything else—the Black Knights don’t have the speed at receiver to run a spread offense, but they do have Sweden’s best center. So Beverly has pledged allegiance to an old-school, three-yards-and-a-cloud-of-dust style reminiscent of the era in which his dad, Randy Beverly Sr., was a Super Bowl III hero for the New York Jets. But the Black Knights need players to do the grounding and pounding. And their roster is only 30 men deep for 11-man football. That’s not enough to have a proper scout team for practice, let alone to have luxurious depth at any one position on the roster. They can use their import linebacker as a running back, but he has a sore ankle, so he’ll only be allowed to play two ways after halftime. They’ll probably end up leaning on their fullback, who is also a part-time defensive end/long snapper/tight end/emergency offensive lineman. Beverly skips the pregame lunch at Behrn Arena early Sunday afternoon (fish, as comes with pretty much every meal in Sweden). He consumes only hot tea three hours before kickoff. “We’re hanging on by a thread,” he says. With football in America in the middle of summer vacation, The MMQB heads overseas for a week of stories on the growth of the game outside the country. American football games are a community event in Sweden. It takes an entire community to pull them off. 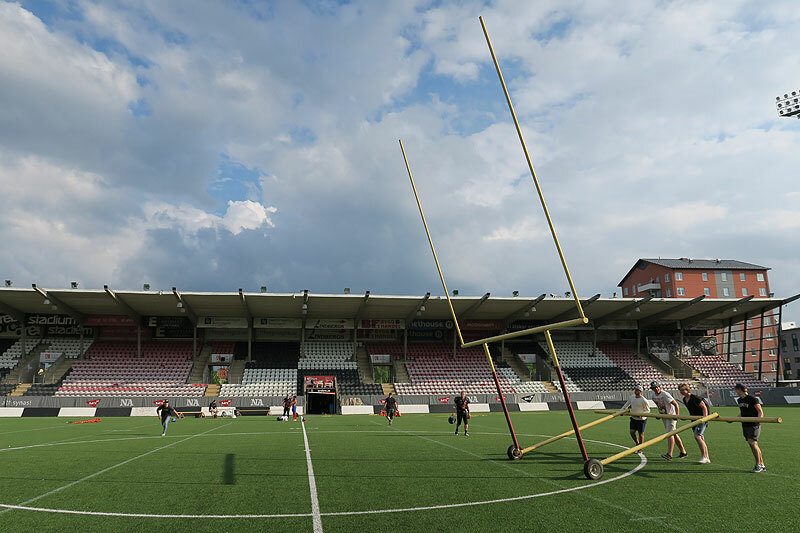 The Black Knights, based in a small city two hours west of Stockholm that has a 750-year-old castle at the center of town, are lucky enough to have the best digs of any American football team in Sweden. That’s because they play in a professional soccer arena, home to the top-division Örebro SK team. 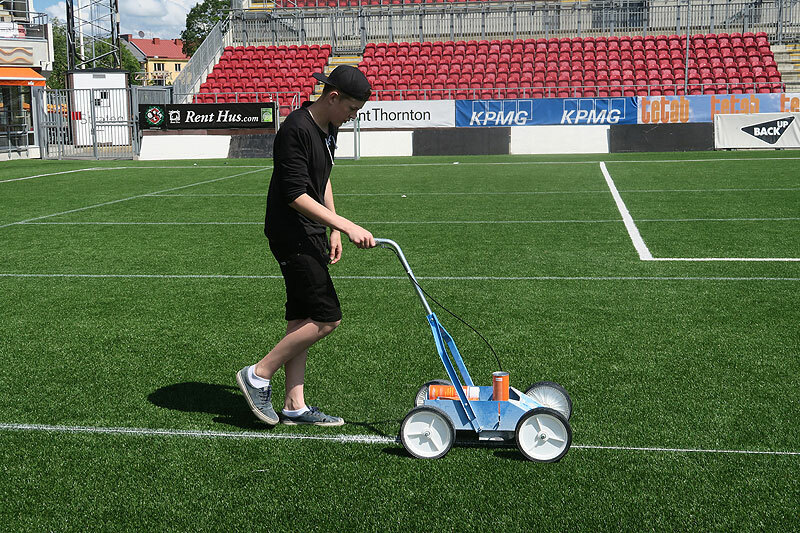 The rules of playing in a soccer arena are clear: You must roll in your own goalposts on gameday, and paint your own American football lines and numbers on the field. Volunteers descend on the stadium hours before the game to get it in working condition, using a system of string and something called a striper cart to lay down the gridiron. The other rule is that when you’re done, you must clean up your mess, which means that Black Knights players have to stay after the game and use water hoses and scrub brushes to return the field to pristine soccer condition. 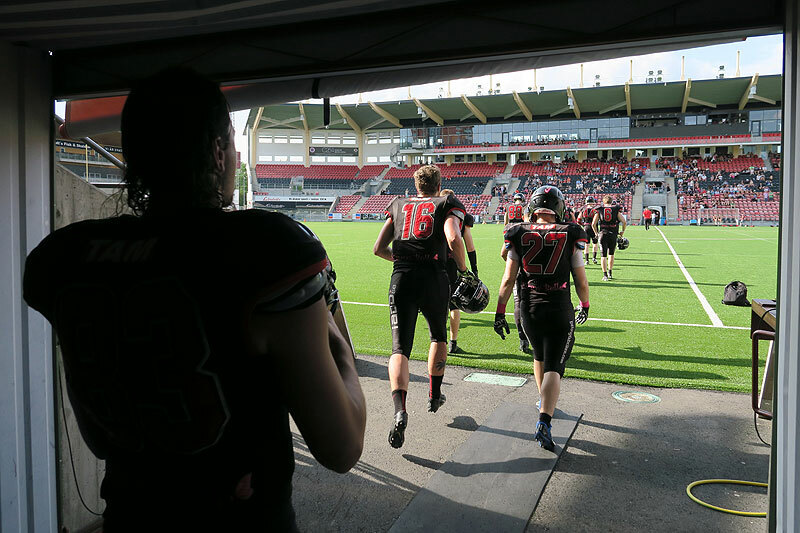 Last season the Black Knights’ games were 30 percent better attended than any other American football team in Sweden: They averaged about 1,500 spectators, one-tenth of the crowds Behrn Arena draws for soccer. American football might be the fastest-growing sport in Sweden, but it’s still very much under the radar here, competing with not just soccer, but hockey and a native sport called innebandy, or floorball. 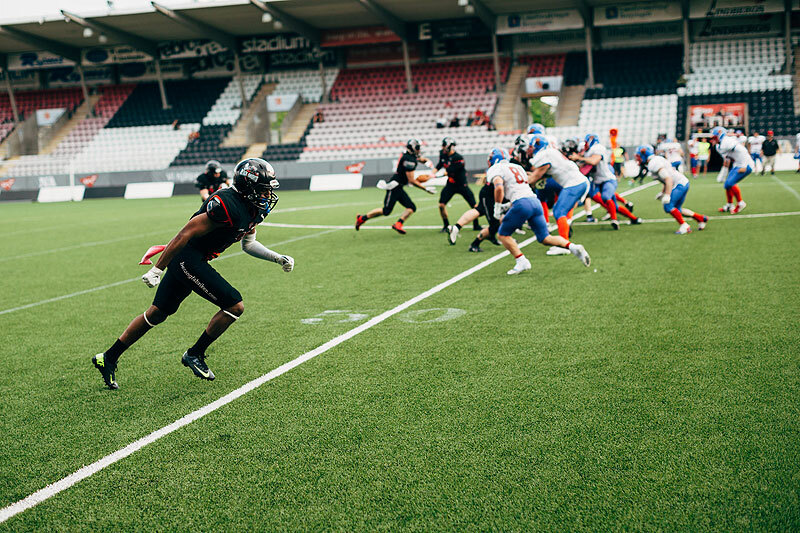 Sweden was supposed to host this July’s IFAF World Championships, an international football event held every four years that could have been a showcase for the sport. But the tournament was relocated to Canton, Ohio, because there was neither the infrastructure nor the resources to support such an event here. Facing tough questions about the direction of the sport in the country, the Swedish Amerikansk Football Federation elected a new president, Minette Rogner, a 35-year-old HR executive who is promoting American football as a sport for everyone—big, small, fast, slow, male, female. But getting noticed, even in a city of less than 200,000 like Örebro, is a labor of love. 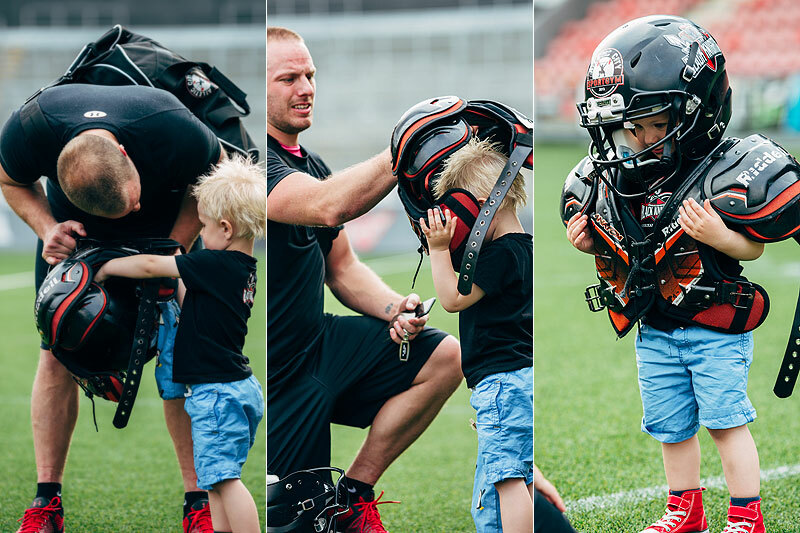 Leading the charge is Micael Jönsson, who is introduced as Mr. American Football in Örebro. He was the chairman of the Black Knights until a few months ago, though you’d never know he stepped down. He’s one of the first at the stadium on game day, patrolling the field shirtless to make sure the lines are painted accurately. When the game starts, he follows the chain crew up and down the sideline, live-tweeting every single play to the club’s 700 Twitter followers. He last played for the team in 2009, when he was 44 years old. In August 1988, something unexpected happened: The NFL staged its first professional game in continental Europe in Gothenburg, Sweden, an exhibition contest between the Minnesota Vikings and the Chicago Bears. The Black Knights were one of a spate of teams in Sweden founded the following year. They didn’t throw the ball at all those first few seasons because they didn’t have anyone skilled enough to do so, until they happened to luck into a former American high school quarterback who followed his girlfriend to Örebro. Teaching fundamentals of the game is still a work in progress. Every week before kickoff, a six-minute instructional video explaining each position on the field and what its function is, plays on the stadium jumbotron. 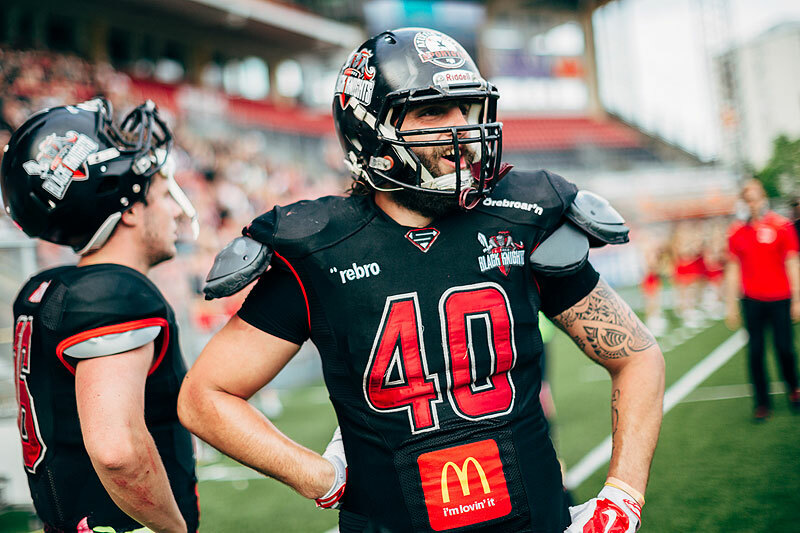 Claes Samuelsson, one of the original members of the Black Knights, has been visiting local elementary schools and day-care centers to give presentations about American football. He quickly learned that the kids don’t have much of a frame of reference for what throwing a football should look like, so the father of two went outside the box. Really far outside. Samuelsson keeps a picture of Joe Montana in his office, as a visual for a proper throwing motion, so he wanted to give the kids something equivalent. He starts with SpongeBob SquarePants. Yes, the cartoon character. In one episode, SpongeBob takes a karate class with pal Sandy. “Think of SpongeBob doing a karate chop,” he tells the kids. That’s the starting point for a throw—hand straight up, elbow raised. “Now, think about throwing a snowball at your dad in the wintertime,” he adds. To throw a snowball hard, you have to step into the throw. Beverly wasn’t kidding about the ground and pound. The Black Knights’ first 14 plays against the Predators are runs. Their bread-and-butter play is “26,” a run directly behind the right tackle. But as Beverly feared before the game, they’re not getting their usual production with a third-string running back. Beverly turns to the fullback who is the jack of all trades, a Frenchman named Cesar Hebel, and asks him to keep running a play called “21." It is basically Hebel charging forward right behind the center and plowing over whatever bodies might be in his way. Hebel is something of a football nomad, traveling the world to fill his calendar with leagues in different countries. Growing up in the suburbs of Paris, he first tried the game after his mom saw a demonstration at a local mall. “I wanted something with contact,” Hebel says. “Anytime you touched someone in soccer, they’d cry. It pissed me off.” Football was his answer. He joined the local club team, the Cougars de St-Ouen-d'Aumone, when he was 14. His worldwide odyssey began three years ago under curious circumstances. Hebel went to play for a league in Brisbane, Australia, where a teammate told him about the Black Knights. Since 2012 he’s been splitting his year between hemispheres, playing in Sweden from May to September and Australia from September to November. During the months in between, he worked in a warehouse moving containers of frozen meat. When the Swedish season ends this fall, he hopes to play in New Zealand. It’s a more common lifestyle than you might think. Milos Lisanin, a Serbian defensive end who has his No. 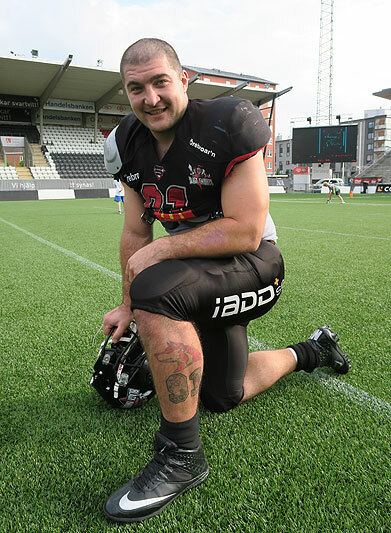 91 tattooed on his left calf, came to Örebro after playing a season in Istanbul. All together, the Black Knights have eight paid import players, from either America or other European countries—though their American-born twin linebackers, Eric and Josh Murphy, don’t officially count toward that tally since their mother is a native Swede. “The Black Knights are a good team with 8 imports and that team has not played to its potential.” —Jon Walker. What’s unusual about the top division in Sweden, the Super Series, is that while the import players get paid to play, the local Swedish players pay out of their own pockets to play. Their membership fee for the sports club is 2,500 crowns, or about $300, which pays for the player’s license with the federation, equipment, travel, etc. The Black Knights operate as a non-profit organization, run by a board elected by the club’s members, with membership dues and any revenue generated poured into making the club run. Game tickets cost 100 crowns, or about $11, but the Black Knights don’t get 1,000-plus fans in the stadium by selling that many tickets. Bigger crowds attract media and sponsors, so the team has come up with creative programs—like free tickets for renting an apartment from the real-estate family that owns the stadium—to get people in the stands. Jönsson and Samuelsson spend their free time doing odd jobs around the city, like picking up trash on weekend mornings or building tents for an outdoor concert, to earn money that can be donated to the club’s coffers. Earlier this summer they brought the import players to help out at a downtown festival where they were paid for every burger they flipped. They raised 15,000 crowns. When Johan Stål, a longtime receiver for the Swedish national team, started playing 13 years ago, players had to chip in for the bus rides to away games. Lately the Black Knights’ efforts to fill the stands have resulted in some important sponsors, including Volvo and McDonald’s. But travel is still done on a shoestring budget: A game in Limhamn, which is about a six-hour drive to the southern tip of the country, is done as a day trip. The team leaves at 6 a.m. and returns nearly 24 hours later. The Predators have made a similarly long drive to play the Black Knights. Part of the reason Beverly’s family is so enthusiastic is they never expected him to get into coaching. His father, who famously made two interceptions in Super Bowl III, wasn’t sure he wanted his son to play the game, because of the pressure and because of the physical toll it had taken on Randy Sr. But Randy Jr. was too electric on the field to stay off it, starring as an option quarterback and defensive back at Central Islip High, not far from the Jets’ former headquarters on Long Island. 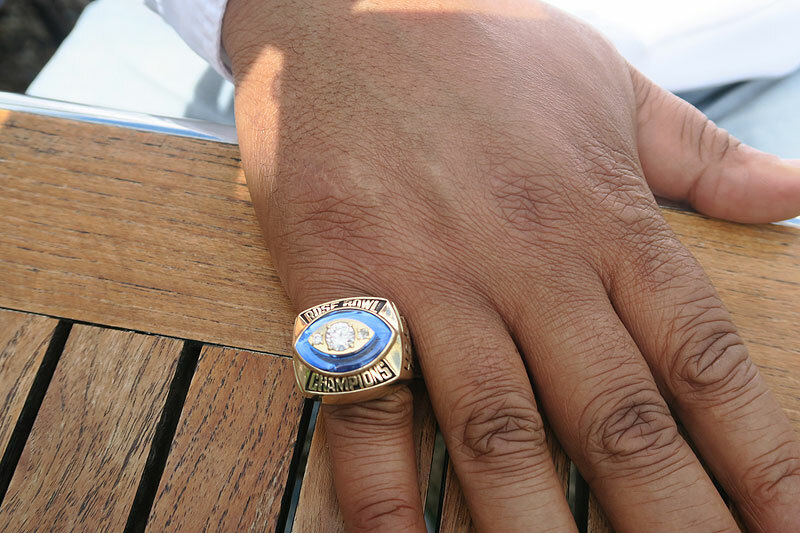 Randy Jr. went to UCLA, where he accidentally had lunch with John Wooden on his first day (it was the only open seat in the cafeteria) and was a freshman on the Rose Bowl team in 1985, a ring he still wears on his right pinky. But that’s when the injuries his father had feared started to catch up with him. Randy Jr. tore his hamstring and separated his shoulder, just like his dad had done. The one that ended his career, though, was a nasty break in his foot, right at the juncture where defensive backs put pressure when they are backpedaling. It was accompanied by bone chips and clotting, derailing his senior season and his NFL aspirations. He began working as a video-game designer, helping create the artificial intelligence for EA Sports’ Madden NFL in the ’90s, when the game’s popularity was taking off. In 2001 he spent a year with the Cleveland Browns, working on developing a virtual reality simulator for quarterbacks. It was video games, not football, that originally took him to Europe in the mid-2000s. But a chance meeting in Milan, with the owner of a second-division American football team in Italy, hooked him back. Beverly liked the version of the game he found in Europe. The players were eager to learn the sport. They craved his knowledge and experience. There are smaller numbers, so you can (and have to) work with every single player. He coached the Milano Rams for six seasons, then set off this year to find a new challenge. Beverly first signed on to coach a team in Norway. But only after he moved there from Milan did he realize the team was in trouble. It had won the championship the year before, and several players decided to retire. It was left with a roster of only 12 players. With opening day around the corner, the Norwegian federation decided the team was not eligible to play. The Black Knights’ season had not yet started, and they were still looking for a coach, so it worked out for both sides. 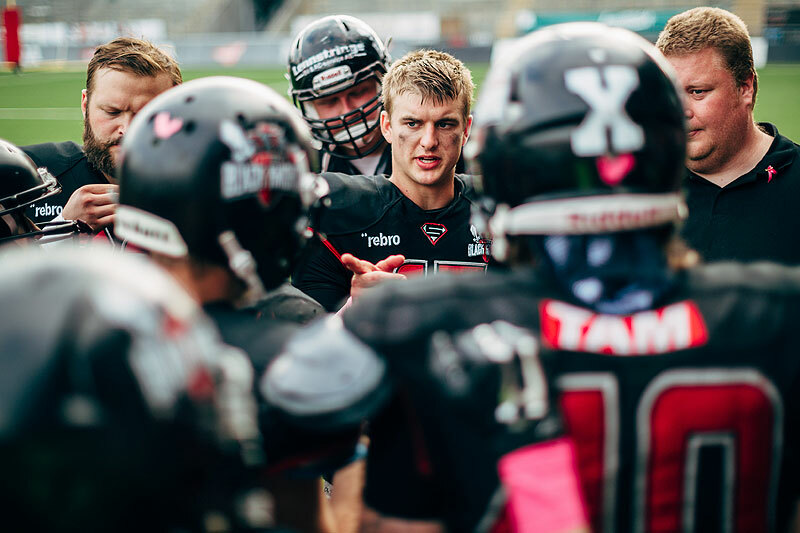 Teams folding is not an uncommon problem for American football in Europe. In Sweden, participation has grown more than 50 percent over the past two years, to 3,800 players countrywide (10 percent of whom are women), but a Super Series team still folded before the season. This is why Martin Söderberg, a board member for the Swedish federation, advocates for the creation of Olympic rules football, with 7 or 8 players per side. The lower participation numbers would help clear the hurdles for starting new teams and making American football an Olympic sport, he argues. Beverly wanted an old-school game, and he got one. At halftime the score is 9-0. Hebel grins and flashes a thumbs up. This is the last game before a midseason break, coinciding with the customary monthlong summer vacation in Sweden, but it already has playoff implications. Despite the high stakes, Beverly is not incensed at the referee for ejecting one of his wideouts in the third quarter and negating a big play in the red zone. The referee ruled that the player initiated helmet-to-helmet contact with a safety. A few weeks ago Beverly actually reminded the officials to enforce that rule, after watching some troubling physical contact at one of the lower-level games. Beverly’s angry coach side does come out, though, when a wayward long snap sails past the punter and into Kristianstad’s possession at the Örebro 23-yard line. The Predators’ quarterback runs in a sneak three plays later to pull within a field goal (they botch the two-point conversion). Beverly promptly yanks the long snapper and replaces him with, guess who? Hebel. With 21 minutes left to play, Beverly’s team needs to hold on to a 9-6 lead. Ground and pound is excellent for bleeding away clock—“Tick, tock,” Beverly says—but things get tense in the final two minutes. The Predators have a fourth-and-15 at their own 38-yard line, with 1:41 to play. That’s when Mike Kagafas, a former Marist linebacker who rues pulling his hamstring at his Pro Day in March, delivers an interception that would make Randy Beverly Sr. proud. Hebel receives a prize for being his team’s MVP—an electric razor, which he looks like he could use—and the Black Knights huddle at midfield. Just as soon as they grab those scrub brushes. Win or lose, no one can leave until the football lines are wiped off the soccer field.